I&apos;m a member of Generation Y, or the millennial generation. People like me were born in the &apos;80s and early &apos;90s. But I don&apos;t like to broadcast that fact. Millennials tend to get a bad rap. Journalists and commentators love ragging on us. They say we&apos;re ill-prepared to deal with life&apos;s challenges. And that, as a result, we have higher rates of mental health issues like depression and anxiety. These ideas have been coming up over and over again for almost a decade now. There&apos;s psychologist Jean Twenge, for instance, who in 2006 published a book called Generation Me: Why Today&apos;s Young Americans Are More Confident, Assertive, Entitled — and More Miserable Than Ever Before. "In past generations, suicide and depression were considered afflictions of middle age," she writes. "But for Generation Me, these problems are a rite of passage through adolescence and young adulthood"
Then there&apos;s the Slate article from a couple of years ago, titled "Why Millennials Can&apos;t Grow Up." The explanation, according to psychotherapist Brooke Donatone: "Their biggest challenge is conflict negotiation and they often are unable to think for themselves." Last year, in Vanity Fair, Bret Easton Ellis called us "Generation Wuss." Even NPR has asked: Are millennials too narcissistic? Do they stand a chance? And now we&apos;re starting to turn against ourselves. 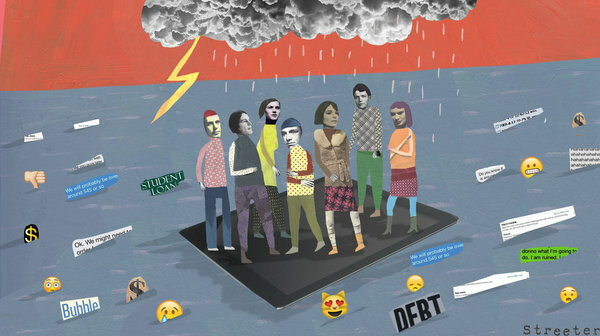 In a recent Telegraph article reporter Rachael Dove, a self-identifying millennial, wrote a piece titled "Anxiety: the epidemic sweeping through Generation Y." My friend Jay and I recently had a good laugh as we read through these articles together. "Harsh," he said. "But also kind of ridiculous." Still, I wondered: Could it be true? Could it be that millennials really are more depressed and anxious than young people from generations past? "I&apos;ve definitely heard reports regarding increased levels of psychopathology among millennials," says Mitch Prinstein, a psychologist at the University of North Carolina at Chapel Hill. "But I&apos;m not sure there are data to support that." It&apos;s true that young adulthood can be a turbulent time — for folks from any generation, Prinstein says. So young people are more likely than older adults to say they experienced a depressive episode in the past year. But we can&apos;t really compare how depressed millennials are with how it was for our parents and grandparents when they were young. That&apos;s because researchers weren&apos;t very good at collecting data on mental illness back in the &apos;60s and &apos;70s, when the baby boomers were in their late teens and 20s. The federal government does have data going back to the early 2000s, and depression rates haven&apos;t increased since then. There are better stats on suicide among young people. Suicide rates for young adults increased through the &apos;70s and &apos;80s, but started dropping off in the late &apos;90s and have continued to decrease. So, it seems young people these days don&apos;t have higher rates of suicide than generations past. So where does this idea that millennials&apos; mental health is declining even come from? Prinstein thinks people get that impression because we milliennials are full of angst. That&apos;s not new. But unlike past generations, we like to broadcast our angst. "Millennials are certainly using social media in a way that we haven&apos;t seen with other generations," Prinstein says. "They&apos;re not as shy about sharing their anxieties online." And we do have a lot of things to stress about, he says, like an uncertain employment future and student loans. But stress doesn&apos;t necessarily equate to depression. "Depression is a biologically and psychologically driven form of mental illness that is remarkably common," Prinstein notes, "but that is not necessarily experienced by everybody who is experiencing distress." Still, some, like Joseph Allen, a professor of psychology at the University of Virginia, are concerned. Allen, who specializes in adolescent psychology, says in many cases, parents have worked too hard to make it too easy for their millennial children. Parents haven&apos;t challenged millennials to support themselves, he says, and millennials may find it difficult adjusting to adulthood. "If you&apos;re living in the basement and playing video games because you can&apos;t get a job or you haven&apos;t been pushed to get a job, that&apos;s going to leave you feeling aimless and a bit at sea whether or not it counts as clinical depression in a formal way," Allen says. But again, at this point there isn&apos;t any conclusive research to prove that millennials feel especially listless or unfulfilled. In any case, Gen Y is doing some things right when it comes to mental health, Prinstein says. Young people are generally more comfortable discussing mental health these days, he notes. And that helps reduce stigma so more people who really need mental health care are getting it. "So I&apos;m not sure if it&apos;s fair to characterize millennials as a group as poorly prepared to deal with life," Prinstein says. "They&apos;re differently prepared."